TWO many things wrong with this animated flick. A biblical disaster! Look, I know that this is a kids film. BUT not even the little ‘uns that were in the cinema were interested. The animation was good at least. BUT not even the bright colours and zany effects could shy away the tepid mess and wishy washy story line beneath its boring surface. It’s the end of the world. A flood is coming. 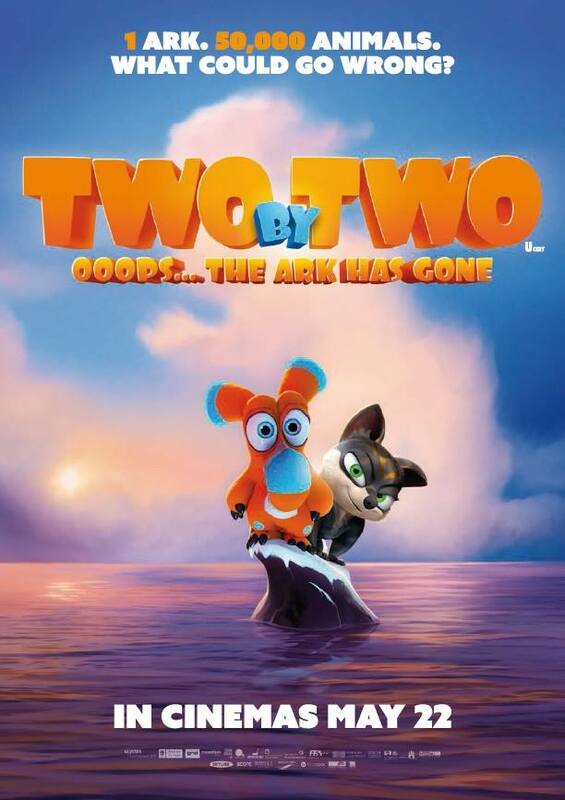 Luckily for Dave (Dermot Magennis) and his son Finny (Callum Maloney), a couple of clumsy Nestrians, an Ark has been built to save all animals. But as it turns out, Nestrians aren’t allowed. Sneaking on board with the involuntary help of Hazel (Tara Flynn) and her daughter Leah (Ava Connolly), two Grymps, they think they’re safe. Until the curious kids fall off the Ark. It’s definitely not going to be smooth sailing. Ah ha. Nice try, IMDb with the blurb. Nestrians? Grymps? That wasn’t even me asking. That was the children. “They weren’t on the Ark? Where are they now?” Of course, it was always going to be exaggerated for the film. And say what you will about the parable of Noah and the Ark but adding new species without any real interest or explanation? Come on! We don’t really find out much about the Nestrians until the closing minutes. Other than that when they are scared, they release a blue smelly gas. Delightful. Too little, too late. The Grymps were just dogs, to be honest. The father/son dynamic with Dave and Finny was a poor rip off of Finding Nemo. A overanxious father afraid to stay settled. Jumping at the slightest sense of danger and moving away to the furthest, most isolated spot in the middle of nowhere. It didn’t help that the predictable cliched set up was hampered with dull jokes that weren’t really funny. Reduced to lazy fart gags and slapstick. Now I don’t mind a little of that. But every 30 seconds to compensate for what little was on offer? Tut tut tut. The only chuckle I got from this was a scene involving an avalanche of boulders descending upon on some predatory gargoyle things in the form of Tetris. An old school reference that went totally over the little ‘uns heads. I’m not going to lie. I almost nodded off. In fact, I might have. The fact I was having to recall whether I slept or not meant the film had certainly not done its job. Woeful. I usually commend family films because they always have something for every one and normally succeed where other genres fail but this offers very little for all. This should have been released as a TV cartoon at best (If they still do weekend cartoons in the mornings). It doesn’t have enough to justify being on the silver screen. The plot holes just rubbed me up the wrong way. A lion appointed by Noah to select what animals get on the list? Really? Also, where is Noah? The lion is steering the ark at one point. The check in cruise liner gag was okay if predictable. The monkey butlers got a little smile. It didn’t help that Leah and Finny were so unlikeable. The journey they go on is so formulaic and uninteresting. It was slapped together so lazily and cornily that I really couldn’t care. Maloney does his darndest to make Finny likeable but he is just so annoying and the poor boy’s voice really does grate against you. Giving a kid with verbal diarrhea a microphone was probably not the best idea. Paul Tylak and Patrick FitzSymons tried their best with Obesey and the parasite that rests on his head (Eurgh! That’s right) Tanglefoot. FitzSymons’ delivery was so flat. He sounded bored doing the role. The only one liner I thought was okay; “I only came for dinner but what can I say, you’re a great host?”. Ba-dum-tsssh! Like the oncoming waves, the film just swept through the motions. Lazy, unfunny and mind-numbing. The creatures only discover key attributes about themselves after a dramatically tense moment in the closing 15 minutes with Finny falling into the ocean. The Finding Nemo references were uncanny but it couldn’t hide just how poor this really was. Disappointed isn’t even the word. But it will have to do for now. I refuse to waste any more energy on this shambolic affair.